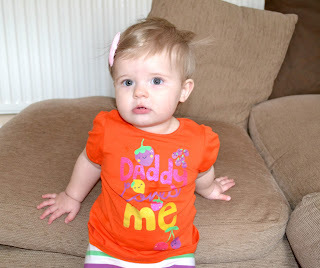 I feel like I've only just wrote Paige's 9 month update and here is her 10th already!! 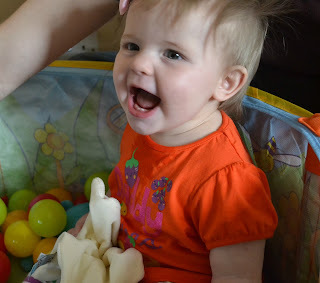 Only 2 short months until she is 1 year old. Crazy! This month she has come a long way. She took her first step at 9 months and 6 days old. Since then she has taken up to 6 in a row and will chose to walk over crawl sometimes. I wonder when she will be full on walking! She has learnt how to give cuddles and is starting to learn how to squat. 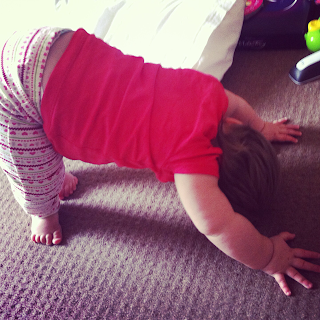 She is trying so hard to stand up on her own and for now it looks like she is doing baby yoga. She also learnt how to climb the stairs... Time for the baby gates I think. She can also climb on to the sofa and catch a ball. She still only has two teeth. Her eating has got a lot better. She now has 3 meals a day although the amount she eats varies and she has three 8oz bottles a day. Her sleep is better but she still wakes up once a night for the most part. We did get one night when she slept through which was nice! First time is over 6 weeks. She had her 9-12m check up with the health visitor which you can read HERE. This also contains her height and weight information.